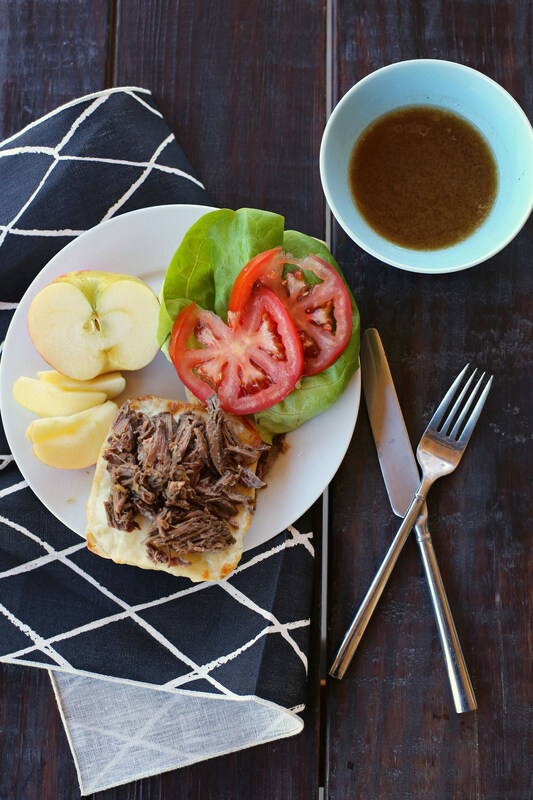 If you’re a French Dip lover, this Crock Pot French Dip Sandwich recipe is a total winner. 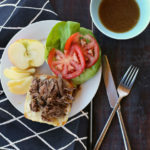 It takes about ninety seconds to throw everything in the slow cooker and when dinnertime rolls around, it’s ready to serve! I’ve mentioned before that I don’t really cater our dinner menu to the girls’ tastes, mainly because kids at that age tend to be totally fickle. Yesterday, they loved broccoli and wanted to have it every night. Tomorrow, they will declare broccoli the most horrible thing they’ve ever seen and they don’t want to eat it under any circumstances (this is theoretical, since I do not care for broccoli and never buy it or serve it because I’m a grown-up and I can do what I want). I saw something going around on Facebook that said that one of the perks of crockpot cooking is that your children can let you know at 9 a.m. that they’ll hate dinner instead of leaving you in suspense until 5 p.m. I know all about that. So sometimes, it’s just really nice to make something you know everyone will eat. And if there is a little round of cheering when you announce what you’re making for dinner? All the better. 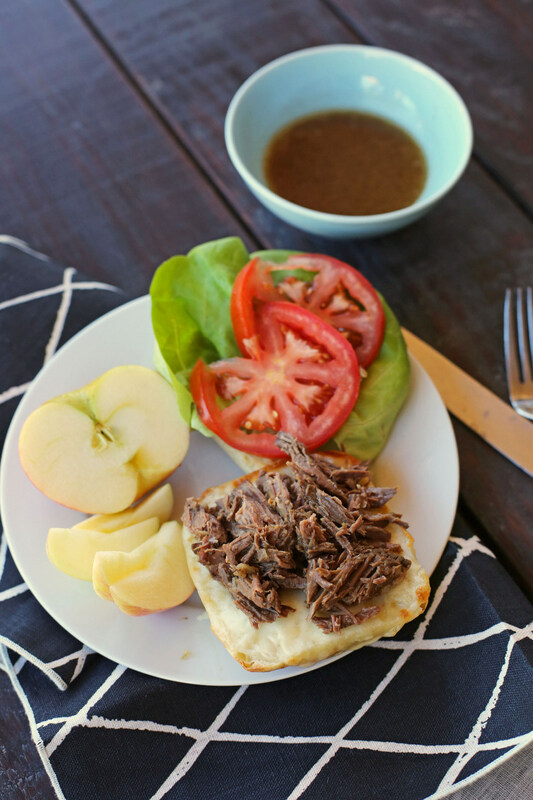 In our family, this meal is French Dip sandwiches. Everyone LOVES them and, bonus, they’re basically the easiest thing on earth to make. And with the holidays coming up, I’m definitely going to be in the “easiest thing on earth” cooking mode for a while. Place the roast in the crockpot (I usually don't even defrost mine), pour the French onion soup mix over the top and then add enough water to just barely cover the roast. Let cook for 8-10 hours on low or 4-6 hours on high. Remove the meat and shred it with two forks. Strain the remaining liquid to remove bits of meat and excess fat and save for dipping sauce. Turn your broiler on low. Slice the rolls in half and spread mayonnaise on each side and place a slice of provolone cheese on the bottom half of each roll. Broil for about 4-5 minutes, until the cheese is bubbly and the bread is toasted. 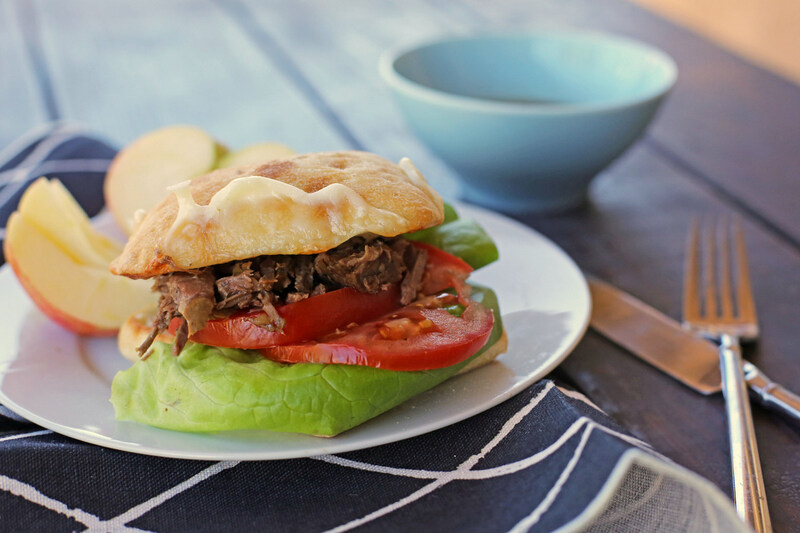 Fill each sandwich with shredded beef, a lettuce leaf and a slice or two of tomatoes and serve with a bowl of the dipping sauce. I make a variation of this a lot, but I use one can of beef broth and then add water to cover the meat. It’s so good! Very easy recipe!!! and good too. To misfit and others who find the juice to be to greasy…This is a very old trick my Grandmother used to do, float a couple of lettuce leaves on top off the juice before placing the sliced meat back in the juice. The lettuce soaks up the grease. Keep doing this until all the grease is gone. MUCH faster than placing juice in the fridge to congeal. I have done this for years! Also, should one find anything too salty, place a pealed potato in what ever, cook for a while, then remove the potato. DON’T EAT potato as it will be very salty. Both of these suggestions are from my Grandmother. She was the BEST cook ever! !